There are a lot of bloggy thoughts going through my head right now. With this lady in town. And this event happening. Life has been busy. And then last week I came down with a death cold. But I’m back, and I’ve missed all of you. I have a question for you, which has a timely request, but first, the back story. I was at swimming lessons with BoyMagine & GirlMagine after school. I stopped at Starbucks on my way to pick them up and I ordered a delicious holiday latte. It has all sorts of carbs, but sometimes they’re worth it. 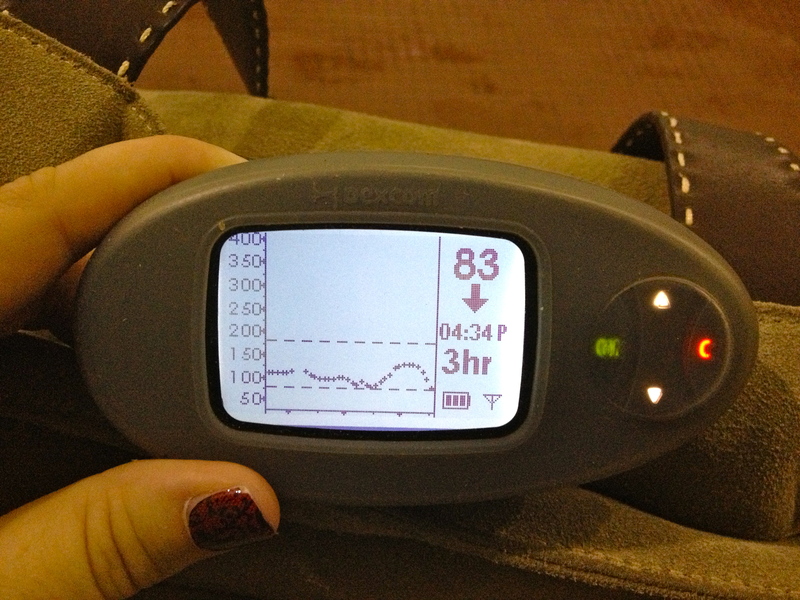 And as I’m sitting there next to the pool sweltering, I’m watching my Dexcom plummet. From 80 to 40 in what seemed like moments. Clearly when you’re frustrated but can’t talk to the people you’re with, the thing to do is take a picture and tweet it & post it on facebook. And luckily I friends with an old camp nurse who explained to me that the fat in the latte was prohibiting the sugar from getting into my body, so the insulin was getting to me before the sugar. Much before. It took me a while to understand, but I got it. She suggested that I do a combo bolus, and the next time I got a latte I tried it. And holy hell it worked. It’s this “technology” that I’ve known about for as long as I’ve had the pump, but nothing I’ve religiously utilized. Well since then I’ve been using a combo bolus for everything (as long as I remember). It has been amazing. I use 65%:35% as long as there is no correction factor and I have it last an hour. There have been less peaks and I’m really pleased with how it has been working for me. Here’s the situation: I used it the other day and then ate again within the hour. I had to figure out how much I had left of the first bolus and add it to the second bolus. Thanksgiving is a classic “eat all day and don’t know what time you’re eating” day. How should I use my approach on Thanksgiving? 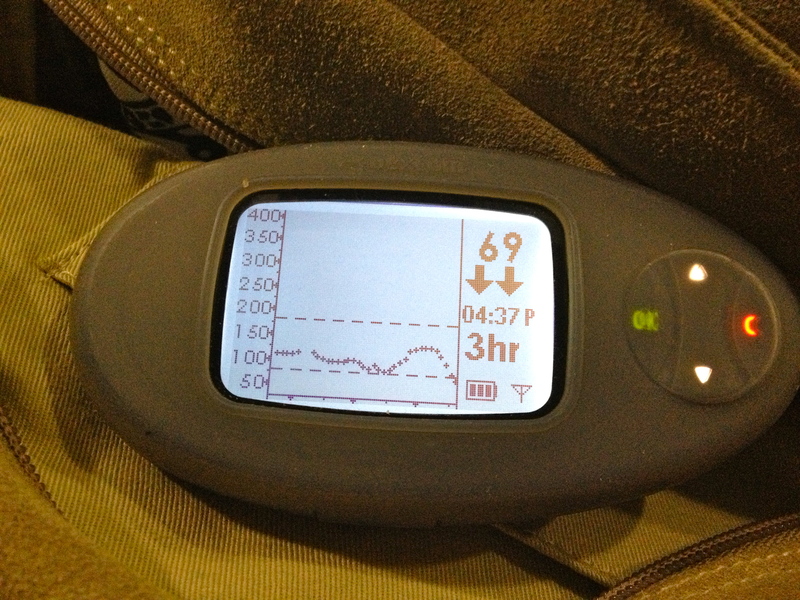 I don’t want to avoid eating to wait for a bolus to finish, but I still want to avoid the peaks. This is also the first Thanksgiving with a Dexcom, so any help/advice you can give is GREATLY appreciated! That’s awesome you figured out the latte! For holidays, I normally 100 to 150% my basal for the whole day, plus my normal bolus (ie, SWAG on homemade yummy things), plus as soon Dex shows any kind of up arrow I hit that number hard. It’s not scientific, but it usually works. Good luck! Unless you are eating a lot of fatty food, it really doesn’t make sense to use the combo bolus for everything. Our food digests faster than our insulin can work, so using the combo bolus for normal meals should have you spiking. Maybe a basal adjustment? For holiday meals on the other hand, I try to pre-bolus as much as possible and because there is a lot of grazing, I do combo bolus for that.